Thanks, Mail Carrier | I'm Mom Blogger of the Week! Say what? After my heart slowed back down to a normal pace again, I clicked over there and found myself on About.com, the information source on... everything. 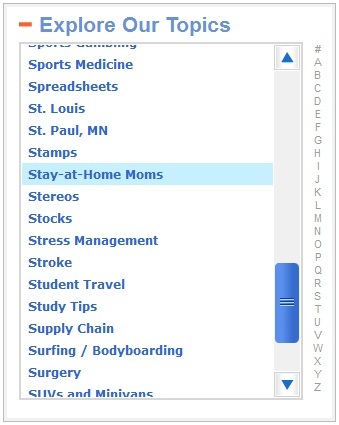 Really, if you're looking for guidance on wild birds, game shows, Italian food, ping-pong, scrapbooking or zoology, they have it. And about every other category that you could possibly think of. Every week in the About.com Guide to Stay-At-Home Moms, Apryl Duncan selects a blogger of the week and highlights what she likes about their blog and why readers should visit. Considering you've already seen the title of this post and Apryl's tweet, you know that this week yours truly has the honor of being featured as the lucky blogger. No, there's no one showing up at my door with balloons and a giant check, but I'm still honored. Everyone likes to be recognized now and then for something that they work so hard on, right? If you'd like to read Apryl's great post, head over and check it out. While you're there, you can also see my profile page and, if you happen to be a member of About.com, leave a review about my blog. As for me, I'm going to back to whistling a happy tune and marveling at the little things that can bring such excitement to my life. Let me be the first to say Congrats!! Just here from FF. Congrats on Mom Blogger of the Week! look at you! how fun! Adding to the list of Congratulations!! You definitely deserve this! "Xenia doesn't churn out review after review without thoroughly testing the product..."
Congrats! and Happy Friday Follow, I'm following you now. Would love to have you follow, too. That is so awesome that you were recognized! It doesn't take much to make Mom's happy, and that is the great thing about us Moms! Congratulatioins, I think you deserve it! Happy Follow Friday. I hope you have a great weekend. Congratulations!! That is quite a pleasant surprise for you, huh? Enjoy the rest of your weekend! Thanks for joining the hop this week. WOOHOO Xenia!! I am SO happy for you:) I can't think of a better deserving person to be recognized for their hard work. I am so proud of my friend!! CONGRATS to you in all your awesomeness.